Raili arrived in September 2014 at the age of 5 months. Accompanied by her breeder Marjo Tuamola, the plane ride from Helsinki didn't phase her one little bit. 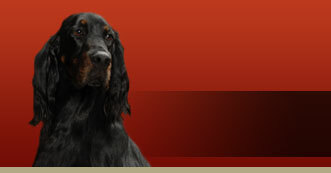 Only 24 hours later she was on the road again, to the Gordon Setter Club of America's National Specialty in Oconomowoc, Wisconsin. Raili is an easy traveller, although she does pretend that getting in a crate is too difficult and needs assistance getting in. Currently Raili is in obedience and agility classes with her co-owner Jennifer Evans.